Do you run an office? If so, you’re probably exceptionally busy, and although you consider having a clean office a priority, it’s frequently neglected in favour of looming deadlines. Of course, you could stay late to get everything in order, but that totally undermines everything we know about maintaining a healthy work-life balance. So, why not hire a professional office cleaning service? Even if you only have a small office, it’s one less job to manage yourself or to delegate, and a dedicated cleaning team like Cleanercare will produce superb results! A professional cleaner will clean your office as often as you need it, making your work environment a more pleasant and productive place to be. In today’s world, time is arguably our most valuable currency and there’s never enough of it! If you hire a professional cleaner to take care of your workspace, you’ll have more time to focus on getting work done. After all, your job isn’t cleaning and so your time is best spent on other profitable tasks. Usually, a professional cleaner brings their own cleaning products and equipment which solves the challenge of storing such items, particularly when they’re hazardous. You don’t need to worry about exposing employees to dangerous chemicals in the office when the only people coming into contact with them are trained professionals who take them off site afterwards. 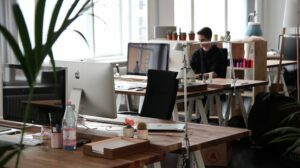 Dust, dirt, and bacteria rapidly accumulate and spread throughout a workspace, especially with lots of employees eating at their desks and handling shared equipment. If your office is being cleaned on a regular basis, the risk of colleagues catching each other’s illnesses will significantly reduce. This can help keep projects on schedule rather than fall behind due to staff sickness. According to this article, 90% of office workers feel more productive in a clean environment. If your team is flagging, perhaps your office needs a thorough spring clean. Having a workspace free of clutter and clean of any grime will help colleagues concentrate on their work more fully. Does your business rely on acquiring a larger client base? If so, think about whether you’d be proud to have meetings in your office in its current state. The work you do for paying customers should speak for itself, but making a good impression when you first meet can help convince clients to give you the business. A dirty, disorganised office won’t win anyone over. If your office is well-maintained, it speaks of your priorities as a brand. If the office looks great, it will convey that you’re organised, care about the workforce and you’re sufficiently invested in your business to be mindful of its reputation. Anyone can run a cloth along surfaces and do the hoover dance but commercial cleaners like Cleanercare are experienced and highly-trained professionals who maintain excellent standards of cleanliness, utilising a range of products and methods. Staff will be briefed to produce results that will meet your exact specifications, so that you can go about your business worry free. If you’d like to make an enquiry about office cleaning, get in touch or read more about our commercial cleaning services here. We’ll be delighted to put a proposal together that meets the needs of your business.